A Dura-Black Steel Stovepipe to Appliance Adaptor will connect Dura-Black to most wood burning stoves. Allows for 1/8 inch difference in flue size. When installing a stovepipe for your stove, it can sometimes be difficult to join the pipe to the stove. This Dura-Vent Stovepipe Adaptor is the solution to this problem. It mates Dura-Black stovepipe to most stoves and allows for about 1/8" difference in size. It is constructed of 24-gauge steel with spot-welded seams. It also includes a damper section to allow you to regulate air flow. This pipe is 6" in diameter and requires 18" of clearance from combustible items. A 5-year warranty is included with your purchase of this adapter. This stove pipe from Dura-Black creates a secure and durable connection between wood burning stoves and chimneys. The heavy steel construction and welded seams make this a strong connection for any ventillation system, and the 6 inch diameter makes it an easy to use product with most Dura-Black products. The sleek black color matches with most vent installations to avoid creating a clashing atmosphere. This 6-inch inner diameter Dura-Vent Dura-Black welded telescoping stovepipe is another fine component in the Dura-Vent Dura-Black catalog. It's insanely durable, and telescopes in length from 44 inches long to 68 inches long for maximum versatility. The whole stovepipe length is covered in a beautiful black exterior finish, making it perfect if you need to keep the pipes exposed. Please note this is designed for use with Dura-Black stovepipe and components of the same 6-inch diameter. This slip connector with trim is used to connect the Dura-Black Stovepipe to DuraPlus and DuraTech chimneys. It adjusts up to 10" to achieve the perfect length to make a secure connection. The connector is made of durable 24-gauge steel with spot-welded seams and comes with a sleek black finish to match the other Dura-Black components. The part is 6" in diameter and 14" long and requires an 18" clearance to combustible materials. A five-year warranty applies to this item. This elbow is part of the stovepipe system that connects wood burning stoves to manufactured chimneys. The elbow helps to offset venting obstructions. The part is made of durable 24-gauge steel and has spot-welded seams. It comes in a 6" diameter and has a sleek black finish. The elbow easily connects with other Dura-Black stove pipe components. . You must maintain an 18" clearance to combustible materials in the finished installation. A 5-year warranty applies to this item. Dura-Vent knows that over time, the needs of your family will change: what as needed and viewed as an essential part of your household 20 years ago could now be seen as archaic and in need of being replaced with something that is more effective. The Double-Wall Stovepipe to Stove Flue Adaptor is specifically designed for Wood Burning Stoves giving you the option to change heating systems to something that will work more effectively for every one in your home.. This DuraVent Adaptor is required to connect almost any wood burning stoves with 6 in. double wall stovepipe to any DuraVent's DVL stovepipe. The damper is included with this adaptor and is made of .016 in. stainless steel inner wall, and .018 in. outer wall-painted black. This adaptor allows for a direct connection, and the included damper piece helps to regulate air flow for your wood burning stove. This adaptor comes with a 25 year warranty. Installing a stove never should be an immense hassle. With the Dura-Vent DVL 6-Inch Double-Wall Black Tee with Cover, you have a part that has been designed to make sure that your stove not only can be installed easily into your home but also is capable of rendering you the best possible service for a long time to come. It has been designed specifically for connecting Wood Burning Stoves to DuraPlus and DuraTech Chimney Systems. Connecting wood burning stoves to DuraTech and DuraPlus factory built chimneys is a snap with this double wall stovepipe. This stove pipe has a .016 in. stainless steel inner wall and an .018 in. aluminized steel outer wall, and easily joins with other Dura-Vent DVL black stovepipe products. This stove pipe also reduces clearance to combustibles to 6 in. for walls, and 8 in. for ceilings and comes with a 25 year warranty. A convenient space solution for Your home, this pipe greatly reduces the required clearance for a stove to a chimney system. The space required for this pipe is merely 6" from walls and 8" from ceilings. The pipe warms more quickly and retains heat longer with its double stainless steel wall construction. Also, this product enhances the stove's efficiency by both venting exhaust and pre-heating incoming air. The pipe features a .016" stainless steel inner wall and .018" galvanized outer wall and is painted in a sleek black finish. This pipe has adjustable lengths convenient for Your situation, and comes with a 25 year warranty. Once Your stove has been installed, the next job for You to do is to make sure that everything is properly connected. The Dura-Vent DVL 6-Inch Double-Wall Black Telescoping Stovepipe has been designed to connect Wood Burning Stoves to DuraPlus and DuraTech Chimney Systems, giving to Your stove the accessories it needs to function properly all the time. You will need to purchase additional items prior to installation, so please check the instructions once it arrives in the mail. This DVL stovepipe elbow by Dura-Vent allows You to connect wood burning stoves to DuraTech and DuraPlus factory built chimneys, and easily offsets obstructions. This elbow is made of .016 in. stainless steel inner wall with .018 in. aluminized steel outer wall, and reduces clearance to combustibles to 6 in. for walls and 8 in. for ceilings. This double wall stovepipe elbow is coated in a sleek black finish to give a professional look to Your installation and has a 6 in. inner diameter and 7 1/8 in. outer diameter. DuraVent DVL Stovepipe/Chimney Pipe Adaptor With Trim - 6"
Of course there's nothing more frustrating than missing a crucial component when installing any new system to your home. These adaptor rings from DuraVent help make the necessary transitions between DuraVent DVL double-wall stovepipe and DuraVent chimney pipe for vertical installations. They're constructed of durable stainless steel on the inside and galvanized steel on the outside, and each adaptor ring comes in an all-purpose, handsome matte black finish. Don't miss this important adaptor part that connects DVL double-wall stovepipe to DuraVent Ceiling Support Boxes and Round Ceiling Supports. This round ceiling support is used to provide support when a chimney must penetrate a flat ceiling. It is 6" high and can support up to 60' of chimney pipe. It is made of durable galvalume. The part is compatible with 6" DuraTech chimney pipes, which is a double-wall all fuel chimney system that can be used with virtually all heating appliances up to 2100° F. The part is made with the high quality construction and superb materials you expect from DuraTech. DuraTech knows that one of the crucial aspects of properly installing a chimney is making sure that is has all of the needed support,. In their All-Fuel Chimney Round Ceiling Support Trim Collar - For Chimney Pipes with 5-Inch and 6-Inch Inner Diameters, you have an item that is designed to make sure that your chimney does not move around, staying in place and insuring that your chimney will remain viable for a long time to come. Pass your DuraTech chimney piping through your ceiling with ease with this 11" Square Cathedral Ceiling Support Box from DuraTech. This venting accessory can support up to 60' of chimney, and can be used on flat and slightly sloped ceilings. This Ceiling Support Box measures 12" W x 12" L x 11" H, and is designed specifically for use with 6" DuraTech chimney pipes. You'll love its sleek black finish and included trim collar. A limited lifetime warranty is included with this ceiling support. If you have a cathedral ceiling, you may want an extra measure of support for your chimney pipe. This handy support box is designed for either flat or cathedral ceilings, and is meant for use with a 6" DuraTech chimney pipe. It can support up to 60' of chimney, and is approximately 12" W x 12" L x 24" H. This product features a black finish, and a trim collar. It also includes a limited lifetime warranty for your peace of mind. Make sure your DuraVent DuraTech system is properly supported and ready to go with this Square Ceiling Support Box. It measures 36 inches tall, and is designed for use with DuraTech pipes and components with the same 6-inch inner diameter. This component includes a 2 inch wide trim collar, and is suitable for either flat or cathedral ceilings. There's nothing like DuraVent Duratech for the ultimate in economical, high quality venting components for your home. This pipe wall thimble manufactured by DuraTech makes passing chimney piping through your room wall a cinch! This particular model of all-fuel chimney pipe wall thimble is compatible for use with six-inch pipes and can be used with both four and ten-inch walls. Constructed out of galvanized steel and backed by a limited lifetime warranty, this pipe wall thimble not only makes your piping job easier, but provides quality support for your chimney as well. This All-Fuel Galvalume chimney tee with cover by Dura-Tech is for chimney pipes with a 6 in. inner diameter. This chimney tee is double wall construction for venting wood, oil, coal and gas appliances, and it creates a 90 degree offset for vent piping. Insulated by a layer of ceramic refractory blanket, this tee can bee used in through-wall installations. This tee is also made with .021 in. stainless steel outer wall and .020 in. stainless steel inner wall construction, and provides a 2 in. clearance from all combustibles. This Chimney tee by Dura-Tech is for chimney pipes with a 6 in. inner diameter, and comes with a cover for the unused offset. Insulated by a layer of ceramic refractory blanket, this tee can be used in through-wall installations. This all-fuel chimney tee is double wall construction for venting wood, oil, coal and gas appliances, and it creates a 90 degree offset for ventilation piping. This tee is also made with a .016 stainless steel outer wall and .020 in. stainless steel inner wall construction, is UL Listed, and provides a 2 in. clearance to combustibles. Be sure that every installation has been properly completed with the most durable materials when you implement a DuraTech design in your projects. This DuraTech product has been created to provide optimal support for up to 60' of DuraPlus chimney, and an adjustable base provides up to 2" to 6" of clearance. Designed from the most durable galvanized steel construction, these tee mounts conveniently on the top of the bracket and the base adjusts to provide 2" to 6" of clearance. This tee support bracket should be used with 6" DuraTech chimney tees and can support up to 60 feet of chimney. The tee mounts on top of the support and the base is adjustable to provide between 2" and 6" of clearance from the combustible wall. The support is made of stainless steel for durability and carries a limited lifetime warranty. The dimensions are 10" W x 11" L with an 11.75" side guard and an 8" opening. DuraTech's double wall chimney pipe is designed for wood, oil, coal and gas appliances. It is made from galvalume and stainless steel and is insulated with a layer of a ceramic refractory blanket. This chimney pipe is constructed with a 6 inch inner diameter and an 8 inch outer diameter. A 2 inch clearance to combustibles is required, and the chimney pipe is equipped with a secure twist-lock connection. If you chose DirectTech to complete your pipe length system, you made the right choice. Durable and finely constructed, this pipe will last you for years. This component is no exception: the DuraTech 6 Inch Diameter 14 to 21 Inch Long Adjustable Pipe is designed for compatibility with other DirectTech pipes and components with a 6-inch inner diameter. You can adjust this pipe's length to meet your needs, from 14 inches up to a full 21 inches in length. And with the Dura-Vent DuraTech name comes an exceptional reputation for quality and endurance. The quality of Dura-Vent DuraTech is simply without parallel. This chimney liner pipe by DuraTech is made of double wall construction and is considered all-fuel-to be used with wood, oil, coal, and gas appliances. The stainless steel outer wall is made from .016 in. stainless steel, and the inner wall is made from .020 in. stainless steel. This chimney pipe is also insulated by a layer of ceramic refractory blanket, and comes with the secure Twist-lock connection technology. This pipe provides 2 in. clearance to combustibles and is designed with a 6 in. inner diameter and an 8 in. outer diameter. If you chose a DuraTech chimney liner, you're going with one of the most durable, flexible chimney liners available. This 6' Diameter x 60" long section of DuraVent DuraTech factory-built chimney liner is tested and listed to UL 103HT Standard for wood, oil, coal, and gas. DuraVent DuraTech is noted for its easy twist lock connections, light weight ThermaTech blanket insulation, and very user-friendly accessories. This five foot section is popular because it can save you money and create an installation with fewer joints. This adjustable Chimney Pipe Wall Strap will allow you quickly and easily provide support for your outside wall pipe installation. This chimney pipe strap adjusts to provide 2 in. to 6 in. of clearance and is intended to be used with 6 in. inner diameter chimney pipe. Made of tough and durable galvanized steel construction, these components are tested and listed for use with 2100 degress F HT chimney system, such as wood stoves, fireplaces, furnaces, boilers, ranges, water heaters, or other appliances. The best way to secure and stabilize chimney pipes is with the DuraTech Stainless Steel Chimney Pipe Wall Strap. This strap can adjust from 2" to 6" and is built with stainless steel to give you peace of mind when it comes to durability. The DuraTech Stainless Steel Chimney Pipe Wall Strap is designed especially for 6" DuraTech chimney pipes and comes with a limited lifetime warranty. Make your chimney pipes secure and stable with this strap today. This chimney elbow kit comes with two galvalume double-walled elbows and one elbow strap. The elbows can be used to offset venting obstructions. The elbow swivels 360° at its base to make getting the perfect alignment a little easier. The double wall construction has an outer galvalume wall and an inner stainless wall with a layer of ceramic refractory material between which permits a 2" clearance to combustibles. The sections connect with the twist-lock method. These elbows have a limited lifetime warranty. DuraTech's chimney elbow kit makes offsetting any venting obstacles easy. Included in the kit are two double-wall constructed stainless steel elbows that will allow for the safe installation of Your heating appliance up to 2100 degrees Fahrenheit, and one elbow strap for added stability. Each elbow only requires a 2" clearance to combustibles and has an inner diameter that measures 6". The components. in this kit have been UL listed and come with a limited lifetime warranty. The DuraTech Elbow Support Strap was designed to help support chimney pipe between offsets. The galvanized steel construction is durable, ensuring that your piping will be stable and reliable for many years to come. This support strap was designed specifically for use with 6" DuraTech chimney pipes, and is the most economical and reliable way to support chimney pipe between offsets. Don't waste your time worrying if your chimney piping is reliable, get the Duratech Elbow Support and do it right the first time. This DuraTech product will keep your vent system working safely at floor or ceiling points even if a support box cannot be used. With dependability provided by a limited lifetime warranty and galvanized steel components, this firestop radiation shield forms an important part of the safety mechanism protecting your home from damage during a fire emergency. This piece is used with DuraTech's all fuel six inch chimney pipe assembly, used with a variety of heating appliances. DuraTech knows that along the way, your chimney not only needs to be fully secured to your house but also needs to be protected from your home. Since it is so hot and contains smoke that could harm both you and your possessions, it is important that you take every precaution to make sure everything and everyone is protected. The All-Fuel Galvanized Attic Insulation Shield is designed to make sure that as your chimney passes through the roof of your attic that the smoke goes up into the atmosphere and that your home stays safe. Your chimney needs to have a strong support structure in order to function properly and last a long time. This Chimney Roof Support can be used with a variety of appliances since it can handle any type of fuel exhaust. It's designed to support up to 45' of 6" chimney pipe above and 20' of 6" chimney pipe below. DuraTech has designed this piece to adjust based on the roof's pitch, so it can be used with any type of roof. This DuraTech chimney trim collar conceals space between your chimney pipe and ceiling when using a rood support. Designed specifically for use with the 6" DuraTech chimney pipes, this durable galvalume construction, with its sleek black finish, is easy and convenient to install. The 5"-8" diameter DuraTech chimney pipe features an inner wall of .020" 430 stainless steel and outer wall options of .016" 430 stainless steel or .021" galvalume steel. For your convenience, this trim collars comes with a limited lifetime warranty. If your chimney pipe extends more than 5' above the roof you must use this roof support bracket to keep it stable. The piece adjusts from 67" to 114" and is designed for use with the 6" DuraTech chimney pipes. DuraTech chimney pipes have a double wall construction and can be used with appliances that are listed for use with a 2100° F HT chimney system. A limited lifetime warranty applies to the roof support bracket. The DuraTech chimney is a double wall all fuel chimney that can be used with wood, coil, oil, or gas appliances. This DuraTech flashing will effectively protect your vent and home from water entrance at the roof termination. The flashing is made of durable aluminum and is suitable for use on flat roofs. The item should be used with the 6" DuraTech chimney system. A limited lifetime warranty applies. Other parts are also required for a complete roof termination. The time has come for your to install a chimney in your home, and you are looking around for the resources to make sure that the process is not only smooth but also one that results in your chimney being properly installed. The DuraTech All-Fuel Aluminum Roof Flashing is an item that should be given due consideration prior to being put into your fireplace. Designed to be used in conjunction with chimney pipes that have a 6 inch inner diameter, all you need is to buy a storm collar and you will be ready to go. This DuraTech All-Fuel DSA Roof Flashing is made to used on metal and tile roofs and does require a separately purchased storm collar. It is made from malleable dead soft aluminum and shapes to fit any type. It is recommended to be used on roofs with a pitch of 0/12 to 6/12 and has a limited warranty. It can be used with the chimney system for wood stoves, furnaces, ranges, and other wood, oil, coal, or gas appliances. The flashing will also work with factory built zero-clearance fireplaces. This chimney flashing is made for a steep roof. This is suitable for all fuels and is made out of study but light aluminum. It will fit chimneys with a six inch inner diameter. This chimney pipe flashing made for steep roofs is made by Dura Tech and will work with perfect compatibility with other Dura Tech chimney vent components. this flashing is designed for roofs with a pitch between a 7/12 pitch and 12/12 pitch. Every chimney needs weatherproofing that goes above and beyond to ensure a proper seal. Any home repair professional is well aware of the fact that if there is any possible way for water to seep somewhere, it certainly will. Be sure your chimney is properly protected from the elements with this storm collar from Dura Tech. The collar fits around the vent pipe and creates a secure barrier that can be attached to the flashing on the roof. It is very important not only to choose the right chimney pipe and to install it correctly, but you must also think of proper maintenance to make it last for a long time. Chimney pipes can easily go downhill fast if you don't install a chimney cap at the end of them. This stainless steel chimney cap is made to be used with pipes that have a 6-inch inner diameter. You should think about purchasing this cap to protect your pipes from damage that the different elements can bring. So, if you have appliances such as woodstoves, fireplaces, furnaces, boilers, ranges, water heaters, or any other appliance that uses wood, oil, coal, or gas this is an important thing to consider purchasing. This item provides support for a DuraPlus chimney system that must pass through a flat ceiling. It can support up to 35 feet of chimney and includes the trim collar that creates a smooth transition between the pipe and the ceiling. The ceiling support is made of durable galvalume and has a height of 3 inches. It is designed for use with the 6" DuraPlus chimney pipe system. The item carries a limited lifetime warranty. This All Fuel Square Cathedral Ceiling Support Box provides support for thorugh the ceiling chimney pipes. A chimney support box is especially good for support in cathedral and vaulted ceilings. This support will hold up to thirty five feet of 6 inch chimney pipes. This All Fuel Square Cathedral Ceiling Support Box is made by Dura Plus and will work with perfect compatibility with other Dura Plus vent components. This support box features a limited lifetime warranty. Passing DuraPlus All-Fuel chimney piping through an attic? Then you need a Galvalume Attic Insulation Shield. This venting accessory ensures any home's safety by preventing debris and insulation from accumulating next to chimney pipes. Shield comes with a firestop, base, and collar. Applications - DuraPlus Chimney is a triple-wall, all-fuel chimney for use with wood stoves, fireplaces, furnaces, boilers, stoves, ranges, water heaters, or other appliances fueled by wood, oil, coal, or gas. Materials and Constructions - .016" 430 stainless steel outer wall or .018" galvanized steel outer wall. .018" aluminized steel intermediate liner. .016" 430 stainless steel inner liner. Two insulating layers (ceramic blanket plus air space). Locks tightly with a precision twist-lock connection. Clearances - 2" clearance to combustibles. Listings - UL Listed to UL 103 (MH7399). This firestop must be used when a chimney passes through a floor or a ceiling without a ceiling support box and is designed both to support the chimney and to protect the surrounding combustible materials from the chimney's heat. It is designed for use with the DuraPlus 6" chimney pipe and is made of durable galvalume. The firestop is 16" high. It carries a limited lifetime warranty. The DuraPlus system is an all-fuel chimney that can be used with appliances that are fueled by wood, oil, coal or gas. This wall thimble makes it possible to pass the DuraPlus chimney pipe through a combustible wall. It will fit walls from 4.75" to 7.75" thick. It is made of galvanized steel with a beautiful black finish and comes with the accessory trim to complete the installation. The thimble will accommodate 6" DuraPlus chimney pipes. The part carries a limited lifetime warranty. Please note that installation of the part requires a 14.5" x 14.5" framed opening. This stainless steel wall thimble is designed for to be used with all fuel chimney pipe. this is the venting component you need when you have to pass a chimney pipe through a wall. Made by Dura Plus, this wall thimble is meant to be used with Dura Plus chimney pipes with a six inch inner diameter. The thimble has a black shiny finish. Made by Dura Plus, the wall thimble has a limited lifetime warranty. This All-Fuel Chimney tee with cover by Dura-Tech is for chimney pipes with a 6 in. inner diameter. This chimney tee is triple wall construction for venting wood, oil, coal and gas appliances, and it creates a 90 degree offset for chimney vent piping. This tee is also made with .018 alvanized steel outer wall and .018 in. aluminized steel inner wall construction, and provides a 2 in. clearance to combustibles. Insulated by a layer of ceramic refractory blanket and airspace, this tee can be used in through-wall installations. Never skimp on quality or else you might find yourself in really big trouble in the long run. With the DuraPlus All-Fuel Stainless Steel Chimney Tee with Cover, you have a tool that ha quality written all over it. Coming with a 6 inch inner diameter, the quality of service it will provide both you and your family is such that you will have no worries whatsoever. However, there is a chance that you might need to separately purchase an installation bracket to insure everything fit solidly. The DuraPlus company provides not only excellent triple-wall chimney pipe products, but also supporting pieces like this support bracket. This high quality bracket is built of galvanized steel and can solidly support up to thirty-five feet of chimney length. A built-in starter section makes it very easy to attach the chimney securely to the bracket. DuraPlus guarantees the material and workmanship of this piece with a limited lifetime warranty. For use with six inch diameter chimney pipe. This chimney Tee Support Bracket by DuraPlus provides support for up to 35 ft. of DuraPlus chimney pipe. This 6 in. inner diameter tee bracket mounts conveniently on the top of the bracket and features a built in starter section. Made of stainless steel construction, these components are triple-wall, and all fuel for use with wood burning stoves, fireplaces, furnaces, stoves and ranges, water heaters as well as other appliances that are fueled by wood, oil, coal and gas. These DuraPluas components are also UL Listed to standard and provide 2 in. clearance to combustibles. This triple-wall chimney pipe by DuraPlus is listed for use with wood, oil, coal and gas application. Its outer wall is 0.018" galvanized steel, the middle wall is 0.018" aluminized steel, and the inner wall is 0.016" stainless steel. Two insulating spaces are contained, one with air and the other with a layer of ceramic refractory blanket. This design permits a 2" clearance to combustible materials and results in a 6" inner diameter with a 10" outer diameter. A limited lifetime warranty applies. Designed with longevity in mind, the DuraPlus All-Fuel Stainless Steel Chimney Pipe features a triple wall design that works well with wood stoves, furnaces, fireplaces, boilers, and plenty of other appliances that use wood, coal, oil, or gas. The 10" outer diameter features stainless steel construction, encasing an aluminized steel middle later and stainless steel inner layer.The exterior features an insulating ceramic refractory blanket, too, and the whole package is backed by a limited lifetime warranty. Build Your next chimney using the quality factory-built chimney available from DuraPlus. This all-fuel galvalume chimney elbow kit offers efficient venting for many appliances including wood, coal, oil and gas-fueled. Because of the triple-wall design, this DuraPlus kit significantly reduces the build-up of creosote and keeps the outer chimney walls cooler. Not only efficient, this chimney kit is easily installed because of the twist and lock features. With the addition of a limited lifetime warranty You can be overwhelmingly assured of the quality of this DuraPlus chimney kit. Nobody does it like Dura-Vent DuraPlus--the ultimate in venting installation components has never ceased to offer a complete set of durable, rugged parts for any installation. This DuraVent DuraPlus 30 degree elbow kit is no exception. This kit has a 6-inch inner diameter and is compatible with DuraPlus pipes and components of the same size, and is helpful in structuring a venting installation around an obstruction. It includes two 30-degree elbow sections and one elbow strap. This elbow support strap can help make the area between offsetting parts of your chimney more stable. With this elbow support, you can keep your 6 inch chimney pipes from suffering from too much tension, and you can improve the ventillation system for nearly any type of heating appliance fueled by oil, coal, gas, or traditional means. Each elbow is made of durable metal construction and comes with a lifetime warranty to ensure long term use. When you are working with chimney piping, the process of securing and stabilizing it is a crucial concern. The DuraPlus Chimney Pipe Wall Strap provides support for your venting,whether it is for wood, coal, gas, or whatever. The precision twist-lock system gives you a secure connection without fasteners and the galvanized steel construction ensures durability. Secure and stabilize your chimney piping with the DuraPlus Chimney Pipe Wall Strap, and make your chimney piping job much easier. This wall strap is used to support and stabilize the 6" DuraPlus chimney pipes when they are installed on a vertical wall. The part is made of durable stainless steel and carries a limited lifetime warranty. Wall straps support the chimney but they also are designed to hold it out away from the wall to create the required clearance to combustibles for the particular system being used. In this case, the wall strap creates a space of 2" between pipe and wall. The DuraPlus All-Fuel Chimney Galvalume Roof Flashing will help to protect the chimney pipes that are vented through your roof from moisture damage. Constructed of durable galvalume the roof flashing is to be used with 6" DuraPlus chimney pipes with roof pitches between 0/12 and 6/12. It is suitable to be used with wood stoves, fireplaces, furnaces, boilers and other appliances fueled by wood, gas, oil or coal. It comes with a limited lifetime warranty. DuraPlus realizes that sometimes the biggest challenge that will face you during the course of the installation process stem from the angle of your chimney. If there is a very steep slope to it, then you will need some specialized equipment to make sure it is properly installed. The All-Fuel Chimney Galvalume Steep Roof Flashing is designed to eliminate the steep roof issue so that you can get the job done and then enjoy the fruits of your labors. Storms bring with them the prospect of causing a great deal of damage to your chimney, but with the DuraPlus All-Fuel Chimney Storm Collar, you have the needed device to take Chimney Pipes with 6-Inch and 8-Inch Inner Diameters and make sure they are well protected at all times. After, all, if you have invested a lot of money in your fireplace, the last thing that you want to have happen is for it to be ruined. This DuraPlus rain cap is used to protect your DuraPlus chimney termination from damage by rain and wind. It is made from durable stainless steel and includes a spark arrestor screen. This part will fit the 6" DuraPlus chimney pipes, which is a triple wall, all fuel chimney system used to vent appliances that burn wood, oil, coal, or gas. The part is 7" in height and carries a limited lifetime warranty when installed properly. The Rancher from Vogelzang is a great heat source, as well as a large cooking stove. With the its large flared cooking surface, you can fit several pots and pans on it at the same time. 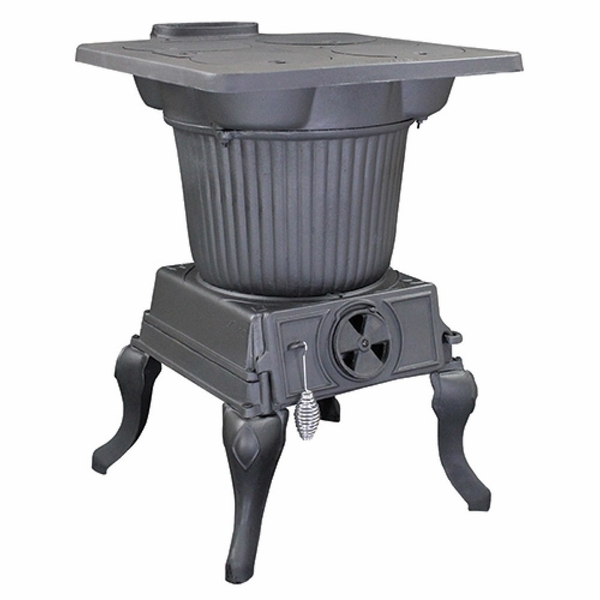 Styled after the old coal stove from yesteryear, this stove brings classic style to any room or cabin. The Rancher offers a lot of flexibility, you can burn coal, lift out the cook lids and you can remove the grate and ash pan for easy maintenance. Where is the firebox door located on this Vogelzang Rancher stove for loading the firewood? The top lid (cooking surface) is removed to add fuel. Does this Vogelzang stove need electricity of any other power source? This stove does not require any electricity to operate. How much clearance is needed in the back of this Vogelzang cast iron Rancher wood stove with large flat-top cooking surface? This is not a UL listed stove, so the clearance to the back of the stove will be 36". You may be able to reduce this to 12", using 24 gauge sheet metal spaced out 1" and covered with brick or stone, but your local code office will have to provide approval for an NFPA 211 method of clearance reduction. Does this stove have the capacity for a rear pipe hook up? While the flue collar is located near the back of the stove, it does not have provisions for the vent collar to be directed horizontally. The vent system would need to be routed vertically from the stove, then immediately turned horizontally. What size logs can be loaded? How many hours may it burn with hardwood? 10 in. to 14 in. hardwood logs are recommended. The burn time will depend upon the draft damper adjustment and spin draft control. The more closed the spin draft is set, the lower and slower the fire will burn. The more open, the faster and hotter the fire will burn. You should add small amounts of fuel each hour or so instead of piling large quantities of fuel at one time. This will insure a more complete combustion process and less buildup of tars, soot, or creosote will occur in the chimney. For additional operation details, please view the product manual.